1. 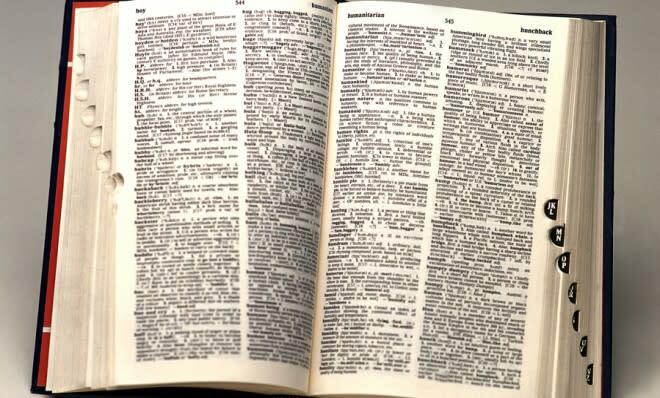 When you open a dictionary to any two-page spread, you are usually looking up a word. It is usually the case, though, that your eye wanders. Words are tantalizing, and a dictionary page holds so much information that it is easy to see something else interesting on the page. Print dictionaries allow for serendipity. 2. In a print dictionary, the senses/definitions of the words are not on separate lines as in an online dictionary. In print, a word's entry is presented in a wraparound paragraph form. Finding the sense and the information you are looking for is a great way of making the brain exercise. If you are reading the entry for the pronunciation, the brain exercise extends by requiring you to either already understand the dictionary's pronunciation system or find the table for it so you are sure you understand the pronunciation symbols. The same happens for the etymology — or word history. There are a lot of symbols and abbreviations used, so you will have to familiarize yourself with them in order to completely understand the word history and be able to explain it to others at the water cooler on coffee break or over dinner that evening. 3. Another brain exercise is simply finding the word in an alphabetical book, which keeps your spelling gene working. If you are great at spelling, you are keeping your skill up. If you struggle with spelling, this exercise improves your spelling IQ. 4. Enjoy the illustrations — at this point, they are still more prevalent in print than online. Online, you are likely to be presented with a photograph of the entry word. In a print dictionary, you may see an intricate line drawing, a colorful illustration, a photograph, or even a reproduction of a painting or statue. 5. Less clutter, and no ads. No pop-ups, no malware, no cookies. No one is trying to sell you anything or trying to get you to read other features. 6. The sheer density of knowledge held in your hands, in print, is an amazing feeling. The nostalgia of a big, paper book is also comforting and uplifting. SEE ALSO: What happens if George Zimmerman walks free? 7. In selecting the book off the shelf, you are looking at one dictionary instead of several at a time as you would on many online sites — so the metalanguage (language about language!) is consistent and possibly easier to grasp. 8. Learning new words is a great "side effect" of looking up a word in a print dictionary — because you can open to any page spread and will very likely see a word or words you don't know. 9. Another advantage to opening a print dictionary randomly or having a look around when performing a specific lookup, is seeing words you have forgotten about. Seeing a word and wondering, "Now, what does that mean?" and reading about it is an activity that almost ensures you will think about that word and probably use it again. Have scientists unearthed the first 'gay caveman'?